I once called myself a ‘pinot whore’ at a wine-club tasting with a crowd of people I’d only just met. (That was before I'd learned to spit.) I was riffing off my friend Howard, a film critic and bon vivant who used to call himself a ‘festival whore,’ since he'd accept any film festival invitation that came his way. I always laughed when he said it. Maybe you have to be a little bit flamboyant and gay to pull it off. I was neither, so I got some concerned looks—and endless ribbing from my husband forever after. However, I do love pinot noir. So at a recent tasting with my own wine club, I came up with the Bring Your Own Pinot theme. The idea was that everyone would bring a bottle of pinot and a story about it. We’d tasting them blind, one by one, guess their provenance, then reveal the wine, tell the story, and retaste. It was brilliant—a great format for forcing yourself to really focus on what you’re tasting, to discuss and debate, and to take the pressure off the host (who normally would be picking and presenting all the wines). But is it really blind when you know your fellow club members inside and out? We knew Patricia was a Francophile, so we assumed she’d bring a Burgundy. As for Claudio and me, well, an Italian pinot nero would be a safe bet. As it turned out, we had some ringers! Which made it great fun. Below were our guesses. The order was random, literally using eeny, meeny, miny, moe. Our guess: Our first hunch was Burgundy, but eventually everyone settled…on the fence! It was either Burgundy or a very Burgundian style of pinot from Oregon, based on its classic transparency, primary fruit (cherry), and earthy notes. Michael thought it seemed more femme than a Cote du Nuit. When we retasted afterwards, the fruit seemed more open and ripe relative to many that followed. Our guess: With its high-keyed acidity, muted nose, tart red-currant flavors, “faint herbaceous quality” (per Michael), and absence of earthiness, all agreed it was not a Burgundy. Andrea was homing in a low-elevation, alluvial limestone areas, but Michael sensed a cool, northern influence, guessing an Austrian blauburgunder. Patricia said, “I smell Alps.” She was right on target. Our guess: We were more stumped with this light, delicate wine. I was thinking Burgundy, but it seemed pretty austere; others detected bubblegum. Our guess: Almost opaque, this was the darkest-hued of the bunch. But it had an Old World nose. A great, beautifully integrated wine, we all agreed. The consensus: Burgundy. Michael thought it was Cote de Nuits, based on its dark fruit and big nose. But then Claudio pointed out the screw-cap peeking out of the brown bag. So we reassessed, arriving at the conclusion: French, but not Burgundy. Possibly Languedoc. We were all wrong. Our guess: This had dark but transparent colors, an Old World nose and taste, with notes of lavender, and a touch of oak. “A confusing wine,” said Linda. First place:Mt. 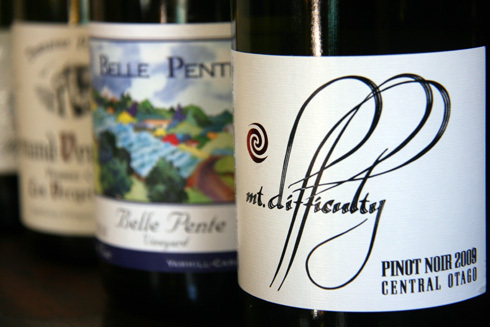 Difficulty An impossible label to forget, and a great pinot to remember. Second place:Belle Pente The Oregonian was just 1 vote behind the leader. Go USA! USA! The rest trailed by a huge margin.